Last year A List Apart sent out a survey for people who make websites. The results were quite interesting. The more people who take the survey, the more relevant it will be. I took it and so should you! Leave a comment if you took the survey! 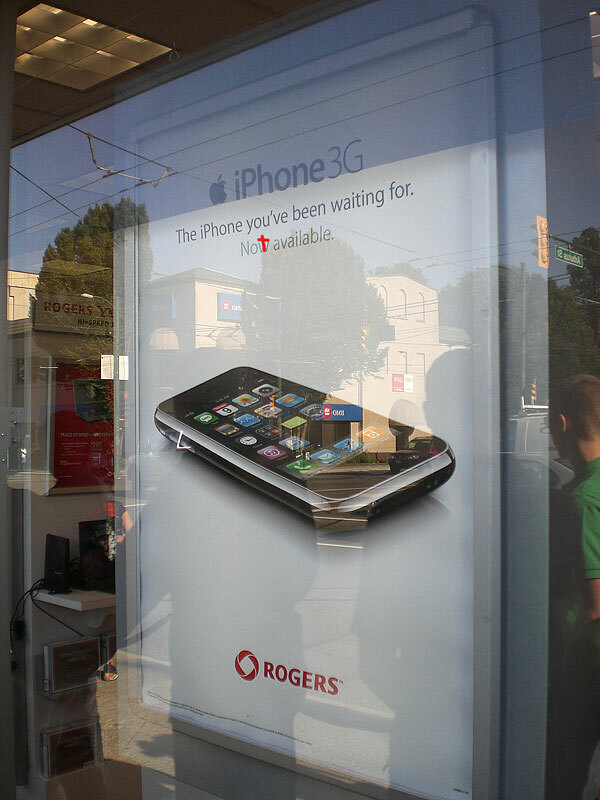 At the Rogers Store on Broadway this morning for the iPhone 3G launch. We stood around for about 2.5 hours and the line didn’t move a whole lot. Breakfast consisted of a granola bar and water. Rogers would give us any info about the number of units until almost 10am, well after the media had left. There was a chance that I’d be able to pick up an 8GB iPhone. But it looked like hours of processing time. And I had work to do. It turns out had I gone two mins from my house I could have walked in and picked one up at 10am – but the drive back to Langley took an hour so I missed out. The only reason I’d attended the downtown launch was because I had to drive my brother and his wife to the airport for their honeymoon. So I figured if I had to get up at 5am, I might as well get something out of it. It was just too bad that the Rogers reps at the launch didn’t level with us about numbers when we got there, as I’d easily have been able to get to the local store in time to have picked one up. It was also kind of funny that when they were interviewing the first guy who got an iPhone (and they were having network problems) the backdrop was a poster claiming the fastest high-speed network. All in all, the people in the lineup made it a good time. But things could have been run much more smoothly. No worries – there’s be more on Tuesday or Wednesday.